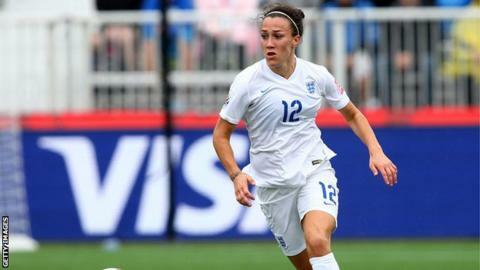 Lucy Bronze is one of four players to withdraw from the England squad because of an injury before their Euro 2017 qualifier against Estonia. The Manchester City Women defender has a knee injury and will not feature in Tallinn on Monday. Arsenal keeper Siobhan Chamberlain (knee), Chelsea winger Claire Rafferty (knee) and Arsenal defender Alex Scott (hamstring) are also out injured. Bristol Academy goalkeeper Mary Earps has been given a second senior call-up. Man City striker Toni Duggan has already pulled out of the squad with a season-ending ankle injury, meaning England boss Mark Sampson has just 16 outfield players available. Goalkeepers: K Bardsley (Man City), C Telford (Notts Co), M Earps (Bristol). Defenders: L Bassett, A Greenwood, A Turner (Notts Co), S Houghton, D Stokes (Man City), G Flaherty, (Chelsea), C Stoney (Arsenal). Midfielders: I Christiansen, J Scott (Man City), J Potter (Birmingham). Forwards: E Aluko, F Kirby (Chelsea), D Carter (Arsenal), J Clarke, Ellen White (Notts Co), G Davison (Chelsea).